Turning trending topics on Twitter into ads is a tricky marketing strategy. Especially when there’s an international conflict going on. British furniture retailer Habitat got into trouble this week for trying to use the Iranian protests to drive users to its site. Using hashtags lke #Iran and #Mousavi, the retailer added notes about its products into the stream of tweets about the Iranian struggle. Needless to say, Twitterers weren’t happy to see those ads. The strategy of turning trending topics into hashtag spam is dubious for exactly this reason. Twitter users looking for news on popular topics are not likely to respond to advertising for random content online. But in the case where the topic is political or serious, it is likely to turn into incredibly bad press. Plenty of Twitter users are talking about Habitat right now, but most of the comments remain negative. Online, tells the BBC: “Advertising in social media can be like gatecrashing a party. 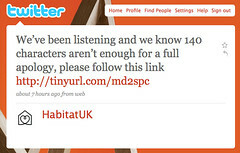 When a backlash to the tweets started on Twitter, Habitat pulled the offending messages and replaced them with product related tweets sans hashtags. They’ve responded quickly and are trying to make amends, but it was at first unclear who posted the spam tweets. Apparently, it was not an experimental strategy on the part of Habitat, but the work of an overenthusiastic Habitat intern, who has subsequently been fired. in this situation, it looks like Habitat has tried to quickly make amends for its misjudgement, but the outcome demonstrates how tricky mass Twittering can be for a company. FOXNews estimates that approximately 10% of Twitter messages are now spam. But companies should think twice before blindly repurposing content as a marketing strategy. The disjuncture between Iranian protests and furniture selling might cause outrage, but other misalligned tweets are likely to meet another fate marketers don’t want. They’ll just get skipped over. 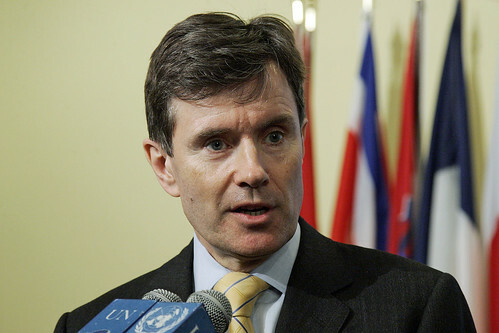 Family details of Sir John Sawers, the incoming head of MI6, were posted on Facebook by his wife. This could prove to be a serious lapse in security for the future Chief of the British Secret Intelligence Service. At the very least, it’s an embarrassment for MI6 and another demonstration that people frequently use Facebook and social media to publish things they later regret. Linkbait. 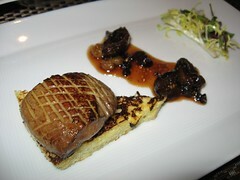 It’s sort of like foie gras and champagne. Even if it’s not your favorite meal, chances are most consumers won’t turn it down. But as a website owner, is linkbait the meal you should be preparing every day? It’s no secret that despite the recession and shrinking overall budgets, major advertisers continue to shift ad dollars to online. Earlier this month, Nielsen reported that in Q1, spending on local Sunday supplements fell 37.7% in the United States. 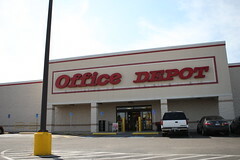 A perfect example of how some of that spend is making its way online can be found with Office Depot.